Just injoy your book very much. when is your new book coming out , i hope very soon. hope i have not read all your story . please send more. (: bobbie thanks for letting me your wonderfull storys. 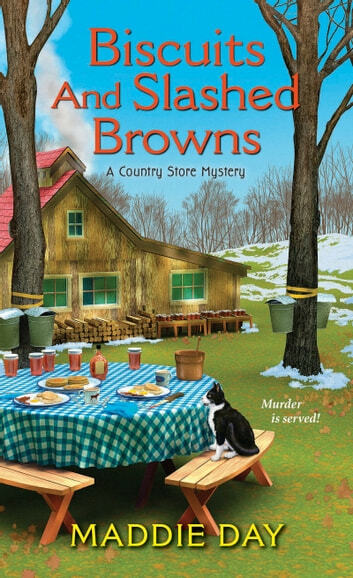 BISCUITS AND SLASHED BROWNS in the Country Store Mystery Series is a riveting cozy murder mystery that has you on the edge of your seat at times while you’re pulling for Robbie Jordan to solve the case before anyone else gets hurt, including Robbie. The characters in the book are enduring, colorful and times irritating like lots of small town folks. You will fall in love with townsfolk as well as their quaint southern sayings. If like me, a southerner, it will make you smile remembering hearing them from the time you were a small child. There’s a nice mix of nationalities, genders and ages in this book which I found really nice. The story is face paced making you to want to keep reading. I know it was very hard for me to put the book down. It has a bit of romance with the continued involvement between Robbie and Abe, but it takes a back seat to the case of the whodunit mystery. I was glad she included some of the recipes for the dishes that were mentioned in the book. Made my mouth water when they were mentioned in the book and I know I’ll definitely be trying them! Maddie Day did NOT disappoint us in BISCUITS AND SLASHED BROWNS! I can’t wait for the next book in the series to see what adventures Robbie and the town of South Like, Indiana can get into. Fourth novel in A Country Store Mystery series! Biscuits and Slashed Browns by Maddie Day is the fourth book in A Country Store Mystery series. Robbie Jordan owns Pans ‘N Pancakes in South Lick, Tennessee. It is March and time for the Fifth Annual Brown County Maple Festival. Robbie has arranged for a breakfast cook off to be held at her restaurant and Robbie will be making her maple biscuits. Professor Warren Connolly is one of the judges for the contest, but several people are not happy with him. Robbie witnesses him having a disagreement with Professor Sonia Genest and Dr. Sajit Rao. The next morning Warren is found dead by the sugar shack on the Rao’s maple farm. The murder weapon turns out to be one of Christina James’ Tojiro knives. Christina is Robbie’s best friend and she has an excellent motive for wishing harm to come to Warren. Robbie knows that her friend did not kill Warren and sets out to find the culprit. The suspect list is quite long since Warren seemed to make enemies wherever he ventured. Then Robbie’s prime suspect, Sajit goes missing. While searching for Sajit, Robbie stumbles upon an illegal venture. Will Robbie find the killer, or will she end up the next victim? Biscuits and Slashed Browns is well-written and entertaining. The book was easy to read and had a good pace. The characters are well-developed, colorful and relatable (they will remind you of your family and friends). I appreciate that the author includes characters of various ages and nationalities. I enjoy the great small-town locale. While Biscuits and Slashed Browns is the fourth book in the series, it can be read alone. The author provides readers with Robbie’s history and touches on past storylines. There is a dash of romance which plays out softly in the background. I like that Abe supports Robbie in her sleuthing (though he does worry about her). The mystery was nicely woven into the story, there are several suspects and the author provided good clues to aid readers. I love the vintage implements featured in the story. The cozy elements include family, friends, the making of maple syrup, cooking, Southern colloquialisms, humor, romance and a smidgen of jealousy. There are recipes included at the end of the book. Biscuits and Slashed Browns is my favorite book in A Country Store Mystery series. I literally may have gained a few pounds. I think I could smell those maple biscuits and well hash browns are one of my favorite things to eat so seeing that cover just had me drooling! The first few pages were just a tad slow but once I managed to get over that hump it was a fun visit at South Lick and then Pans N Pancakes Cafe. Biscuits And Slashed Browns is the 4th title in the Country Story Mystery Series. Although it is a stand alone I did have a disconnected feeling with the sub characters. I think having read the previous installments would have pulled things together more for me. This was a good cozy mystery. I enjoyed getting to know the characters and I do want to read the earlier installments so I can make the connections that I missed. I am looking forward to more in the series and look forward to stories around the bed and breakfast. The author included a variety of recipes at the end. I am looking forward to trying the Eggplant Bake! I received a complimentary copy from Great Escapes Tours.